The Page 69 Test: "Butter Off Dead"
Page 69 of Butter Off Dead starts with business—our amateur sleuth, Erin Murphy, runs a mercantile specializing in regional foods, in her family’s hundred-year-old grocery, and she’s busy fixing a ceiling leak, installing new shelving, and wondering why her normally-calm mother threw a tantrum over a broken martini glass. She’s pondering the suspicions circling around her brother, Nick, a wolf biologist, after the death of his girlfriend, when the shop phone rings—and it’s for Nick. A few minutes later, when all was quiet, I snuck up the steps and peeked into my office. Nick sat in my chair, stunned. As if he’d been struck by one of his own darts—humane darts, used in tracking and collaring wolves. I pried the receiver from his hand, set it in the cradle, and waited. “She never made any money. Her paintings were too affordable.” The proof hung on the wall. There’s very little Erin thinks can’t be fixed by lunch. Her mother, Fresca agrees. A few lines down, Fresca’s arrived and the three are toying with their sandwiches. The fifteenth anniversary of the death of her husband—Erin and Nick’s father—in a still-unsolved hit-and-run is approaching, and all the family feels the welling emotion. For Erin, only seventeen at the time, it was a triple loss: her father, her childhood, and her best friend, Kimberly, now the local sheriff’s detective in charge of the murder investigation. This is the third book in the series, and both the current murder and the death of Erin’s father will be solved. Our front door chimed and I stopped myself. So page 69 is a bit quiet on the surface, but the emotional undercurrents are deep and swirling. We read, I think, as much to form emotional connections with the characters and explore their own emotional ties and dilemmas, as for the action. 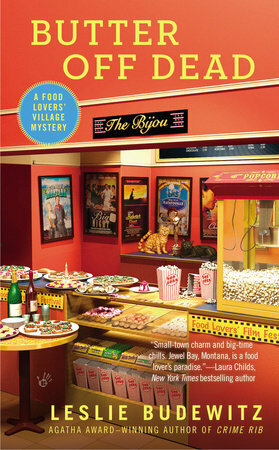 There is plenty of action in Butter, including Erin’s encounter with a rabid wolf-hater who thinks her brother is doing the devil’s work, near-disaster in a Playhouse filled with townspeople eager for the opening of the First Annual Food Lovers’ Film Festival, and a clash with a collector whose passions have become deadly obsessions. But the modern mystery is about much more than crime. The amateur sleuth uses her insider knowledge to unearth clues and motives that law enforcement doesn’t always see—or see in the right way. While the job of law enforcement is restore external order, the amateur sleuth restores the social order. Page 69 gives us a few hints of how that will happen—that justice will be served, order will be restored, and dinner will be on time.